“Really, Wayne Thiebaud’s drawing?” was the question a lot of people asked to the curator Isabelle Dervaux when she decided on the focus of the Morgan Library & Museum’s new exhibition. In fact, the Morgan is the first institution to explore the artist’s lifelong engagement with sketches. Well known for his lifelike paintings of luscious pies, glossy candied apples and colorful ice cream cones, Wayne Thiebaud also spent his whole career ­–over 70 years of work– as a draftsman. This exhibition presents in a chronological order a relevant panel of his work, half of which came from his studio in Sacramento. The show opens with a series of works from the 1960s. Jelly apples, candy sticks and so on are declined in different techniques and materials, proving the artist’s early interest in investigating the properties of a variety of mediums. He tries to avoid the sentimentally of classic American paintings and focus on surface texture more than the formal elements of design and composition. In Nine Jelly Apples, Thiebaud plays with a range of red, pink and purple watercolors and graphite, to give to the surface of the fruit a luminous aspect. 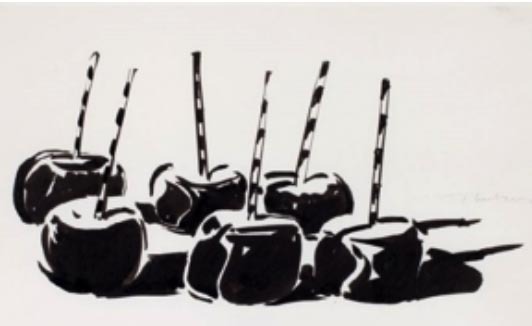 In the nearby version, Candied Apples, he works on the intensity of the black ink, opposed to the untouched white of the paper, to convey the shine of those fleshy apples. The accuracy of the pencil in the third interpretation of this subject, Three Jelly Apples, focuses on the material aspect of the hardened sugar surface, and reveals the technical virtuosity of the sketcher. According to Isabelle Dervaux, Thiebaud likes the idea of series, of rows. These drawings, all from 1964, testify that since the beginning of his career, his approach has always been much more controlled than abstract. Wayne Thiebaud studied at Frank Wiggins Trade School, in Los Angeles, where he learned advertising, illustration and design: he originally wanted to be a cartoonist. 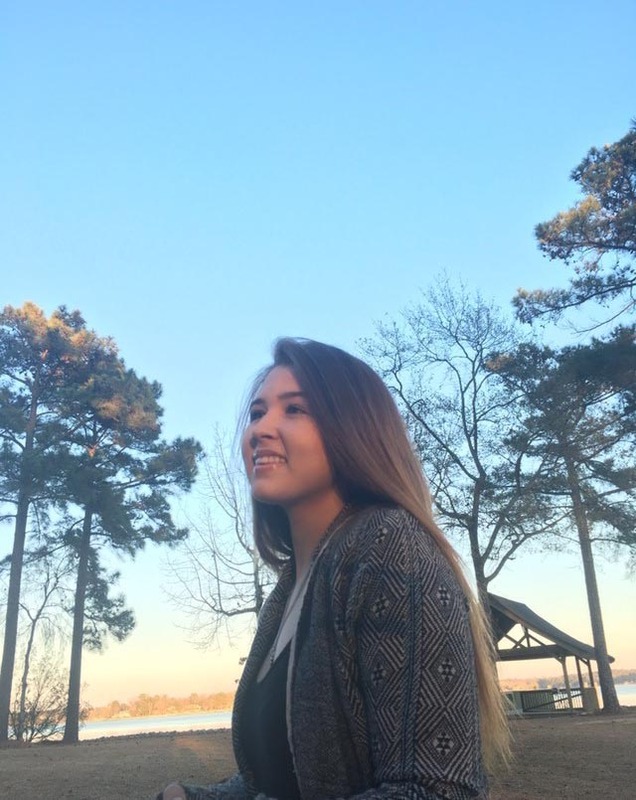 Finally stimulated by his interest in Art History, he decided to become a painter, but this untraditional training would have a major influence in his later work and on his way to comprehend subjects. Actually, the artist’s figurative food theme isn’t innocuous: it echoes his desire to seduce the viewer as well as the publicist wants to seduce the costumer. “Surprisingly, I didn’t think of pies at first.” As many young artists, Thiebaud went to New York in the 1950s. There he met people from the contemporary art scene such as Franz Kline and Willem de Kooning. But in the words of Scott Shields, senior curator at the Crocker Museum: “New York’s Abstract Expressionism didn’t work as well for the West Coast people—that brooding angst didn’t fit,” and Thiebaud struggled to find a place. After a challenge by de Kooning to “decide what you like, what you want to do,” he went back to very basics: shapes and lines, recreating typical American objects. 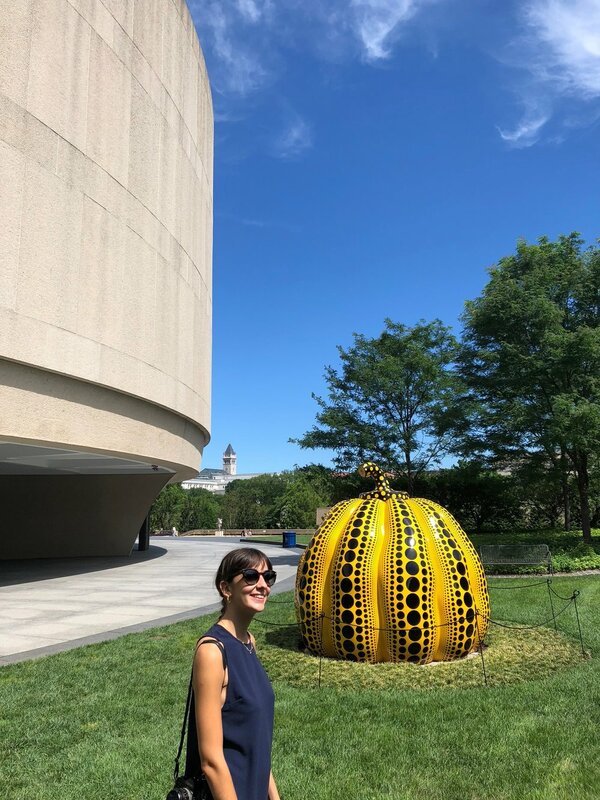 At the opening-night conversation with the curator Isabelle Dervaux, the artist said that his depictions of slices of pie on plates derived from a simple formalist desire to put triangles on ovals. It felt “interesting and comfortable” to him, so he continued. Using his experience as a light technician -he worked at Universal Studios in his early career- he started to focus on the luminosity in his drawings, exploiting the radiance coming from the objects themselves. Hence, he created a new kind of imagery –with light subjects and bold shadows– which made him famous overnight after the Allan Stone Gallery in New York exhibited his works in 1962. After reading « Interaction of Color » by Josef Albers, published in 1963, Wayne Thiebaud starts to work on colors. Inspired by this ouvrage, he combined conventional shading with unexpected color juxtapositions, opposing bright and colorful objects before pale backgrounds. A contrario of the Pop Art movement, which was developing at the same time, Thiebaud’s art was warmer and melancholic, in part due to the fact that he drew from memory, immersing himself into a nostalgic recollection of bakeries and diners from his youth. When Warhol was cool and ironic with his soup cans, Thiebaud was nostalgic and gentle with his lemon meringue and pumpkin pies. Wayne Thiebaud never stopped drawing sketches, whether it was as a daily exercise or to jot down ideas for his paintings. This exhibition honors this substantial part of his work by unveiling an entire wall of his sketches that, for the most part, have never been shown before. The sheets presented are compositions, made up of different illustrations connected more or less consciously by the artist. 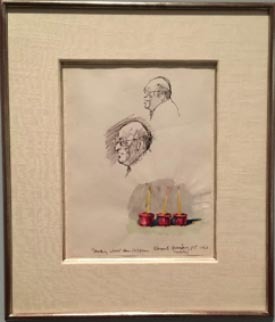 For instance, in a pen, ink, and watercolor drawing from 1986, he matches up two portraits of art critic Clement Greenberg –we know from Thiebaud’s notes at the bottom of the sheet that he was giving a lecture on the artist Hans Hofmann at Berkeley – with three jelly apples in the critic’s favorite color. From the 1970s, Thiebaud’s work showed a stronger engagement with the art of the past and the old masters that he admires. Accordingly, he changed his way of working to a more academic practice, and started dedicating time every week to work from the model. An anecdote related by Isabelle Dervaux describes Thiebaud, with the best of intentions, imitating even the signatures and dates of certain canons. The artist said he draws “to find something, to make notations or just to experiment.” These sketches actually divulge crucial elements on which he works: proportions, light effects, and vantage points. And if those drawings are more traditional than the comics’ style he first developed, the subjects are still very modern. For Thiebaud, another way to depicts American culture was to work on cities, streets, and the drama which exudes from them. “These drawings seemed to offer more the kind of visual and physical feeling that was closer to the idea of San Francisco” he said. The last part of the Morgan’s show presents a selection of these works from the 1980s. With wildly shifting perspectives and geometric patterns created by curves and edges of the urban landscapes, Thiebaud oscillates between copy and composition. In his 1983 drawings of San Francisco, he plays with the intensity of darkness and its fateful effects on the composition. Here again, the materials used -ink and charcoal- refer to the influence of the artist’s first interest in lights and shadows, recalling his mastery of the film noir. “My own sense of being American is a very important part of what I feel and do,” he said. While Pop Art was more interested in advertising, Thiebaud was paradoxically more traditional and focused on capturing a uniquely American sensibility. We can actually feel that this Americanness infuses his entire work, starting from the rows of pies, the gumball machines, to the urban landscapes. By choosing to focus on the artist’s drawings, this exhibition offers a glimpse of the evolution of the artist works, which have an atmosphere all of their own: sweet, heartening and beautiful. During a recent conference at the Morgan Museum at which I assisted, Isabelle Dervaux lauded the artist’s continuity. “And you know what?” she asks at the end, “He still made pastel and pies”.